Recreating restaurant style food at home is fun but can be frustrating when the same flavor cannot be replicated at home. In most restaurants, while ordering biryani, they serve a gravy to go with it. 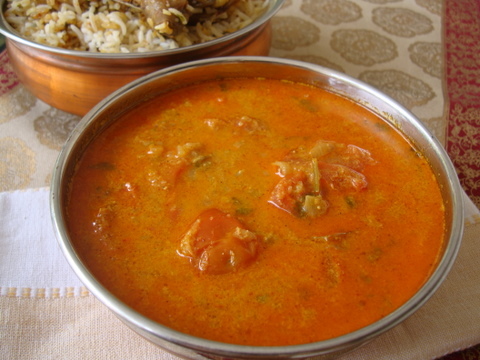 The gravy that accompanies the biryani differs from restaurant to restaurant. Often, we try to recreate this subtly spiced gravy at home but with little success. Today’s recipe came close to the restaurant flavor, a vegetarian version with absolutely no meat in it and goes well with vegetable biryani and pulao as well. 3 Add 2 cups of water and salt and bring to a boil. Cook with lid on simmer till the gravy thickens. Add thick coconut milk and garam masala and mix. Turn off heat. Garnish with chopped coriander leaves. Turn off heat. That gravy looks excellent, I will have to try! Lovely colour :). Sailu, in TN they use fennel seeds in kurma and that gives that unique smell and taste. My mom used to make this kurma for a bland coconut milk rice. I am sure it is a great side for rotis too. Woww… looks amazing dear.. nice click too.. thanks for sharing !! This is perfect! I have been searching for this recipe for a long time. Thanks a lot for sharing! Big kudos to you for posting excellent recipes with pictures. Side dish for chicken / meat biryani is usually mirchi ka salan…could you post that too Sailu at your convenience. This dish is probably served with pulao..got to try this one out. Thanks for the lovely recipes again Sailu. hi sailu, been following ur recipes for almost a year. My mom is praising me for all the nice dishes i am re-creating at home. Have just one doubt, are poppy seeds really necessary for this recipe ?? or can i substitute them for anything else?? Pls tell me. Thank you… bye and take care…….. Yes. But if you do not have it on hand, omit it, increase cashew nuts to 6 and follow rest of the procedure. Hi Sailu, sorry for being a bit naive, but what is elachi, thanks spikey. Nice.I was reading some old post and read someone’s suggestion about you using watermark for your photos to prevent plaigarism.I think its a nice idea which many bloggers implement…although i feel it spoils the beauty of a photo,i just cant stand cheaters! I visit your blog often and I have been trying many of your recipes with great success. It’s a pleasure even to just browse through. With thanks that’s overdue, I have a request. I need a recipe for gravy like the one here, but without peanuts and nuts (not even coconut). Is there one like that already posted? Or, could you suggest alternate ingredients? Wow , this is mouth watering. Love the way you used tomatoes in this recipe to bring color and tangy flavor to the dish. hubby has been asking for this dish, will try tommo, thanks for posting it. This is truly a keeper recipe. Love how you have mingled the flavors. i am very much impressed by ur recepies. gravy recepie is looking good. planning to try it on sunday but i can’t understand what kus kus means. can u please tell me its name in telugu if possible. thank u very much sailu for blogging good recepies for all of us. I tried it and came out excellent..Cannot wait to make it again..
Wow.. mouth watering gravy. A perfect acompaniment for a perfect biriyani. All your reciepes are easy to follow. I tried this gravy today with veggie biriyani. and served it for my guests and taste is really really amazing. our guests and my husband loved it a lot and asked for ur blog link. soo one more successful dish in my account from u. thanx a lot for ur dishes once again. can you pls post recipes of beetroot kura, carrot kura. Hi..super recipes…i am enjoying learning them………. My Dear Husband’s favorite dish “DHAM BRIYANI CHICKEN/MUTTON”. Tomorrow is his B’day. I’m making Dham Briyani and I will try this gravy too. Thanks Sailu….For posting such good and useful recipe for all briyani lovers. I prepared this dish with some changes, turned out fabulous. Cooked this about 2 weeks ago and liked it very much. And today I added chicken into the gravy as I added water and it turned out so tasty. I just fried the chicken 5 minutes with some oil and pepper powder before adding into the gravy. Thanks for the recipe. Not just this one but for all the other recipes as well. Our family enjoys all your recipes. hi sailu, this is the first time I posting comment and i have tried some of ur recipes. they are nice. Can u tell me how to make coconut milk? And how long can we store the coconut milk?? i am very thankful to u for posting this recipe. i’ve been browsing so many sites for this recipe since a long time..i am looking for more kids meals in ur blog..
Ur recepies are very good. I tried soya chunks vegetable polao, it had come very nice. the only doubt i have is….. is there any substitute for coconut milk? is that compulsory to put in side gravy for biriyani recipe and soya chunks pulao? or is there any alternative. please tell. Coconut milk is essential. If its not available omit it and add little milk towards end of the cooking process and go on stirring on low flame. you have missed “garam masala” in the method of preparation. Pls update it..I tried this recipe..It was “wow”…Pls teach me how to make paneer biryani..
Can I add a brinjal or other veg to this?